Of course, I’m not saying everything is perfect now. But I’m definitely way better off than I was a few years ago, and a lot of that has to do with how I’ve changed my perspective on pain. 1) Understanding that not all pain comes from a physical injury. This helps cut down on the cycle of fear. We grow up thinking that pain must automatically mean we are injured. However, pain is actually a lot more complicated this, especially in the case of someone whose body has been through some sort of trauma. Pain is the body’s protective mechanism, and sometimes it can go a little bit haywire and “overreact,” causing you to feel more pain than you used to. (I have written a lot about this in past posts, so I am not going to focus on it as much in this one. But if you are new to my blog, definitely check out my page on “Calming Your Nervous System” for more!). 2) Learning as much as I can about the body. When you are caught in a cycle of chronic pain, when your body’s “alarm bells” seem to be constantly ringing, knowing more about the body can help you turn down the signal. Pain is a dynamic interplay between the body and the brain. The body can send signals up to the brain, to determine if action needs to be taken. The brain can also send signals down to the body asking for more information, if it wonders if the body has been hurt. When you have a chronic condition, knowing more about your own body can help turn down some of those alarm bells when they start ringing. A few years ago, when I first began to have knee issues, there was one night where I experienced extreme, stabbing pain in one leg. The pain didn’t make any sense to me—it ran in a diagonal line from the outside of my upper thigh, across my leg, to the inside of my knee. At the time it really freaked me out. I had no idea what could cause pain to run in such a diagonal pattern. Since it wasn’t a muscle, I thought, it must be some kind of serious problem involving a nerve. Maybe it was even a pinched nerve in my lower back. I burst into tears, took a ton of Advil, and waited desperately for my next physical therapy appointment. Well, it turned out that there is muscle that runs diagonally across the knee, along the exact same path that the pain ran that night. 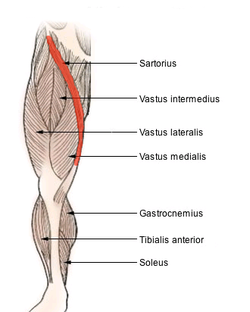 I was simply experiencing a spasm of the sartorius muscle, which runs from the outer thigh to the inner knee. If I had known this at the time, I probably would have been able to avoid freaking out so much. Just because the pain is severe, it doesn’t necessarily mean the condition is severe. A muscle spasm like that one can be extremely painful, but it isn’t really “dangerous.” It’s just a sign that the muscle is overworked and you need to rest it and do some stretches. I know that now, and I’ve definitely had muscle spasms since then. But none of them have set off the same pain “alarm” bells, and I’m sure that part of that is because, on some level, my body has made peace with the idea of muscles being overworked and needing to rest. I’m not talking about a conscious process. It’s something that probably happens below the level of conscious thought. Of course, my life isn’t perfect now. I still have some physical issues (specifically, my ongoing saga with the sacroiliac joint). 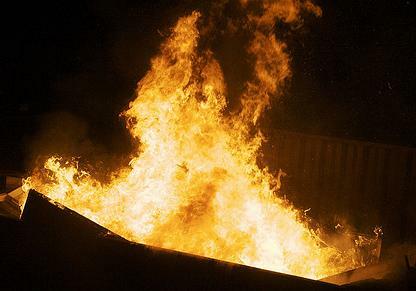 But I just don’t seem to have the same overblown, five-alarm-fire response to pain that I used to have. I think my physical issues are probably worse now, in an objective sense, thanks to the sacroiliac issues that I’ve had for the past two years. But I am actually in less pain than I was a few years ago, where I went from doctor to doctor, only to be told that nothing was wrong, and it’s largely because I helped to calm my nervous system down. It’s not that I’ve learned to block out pain, or anything crazy like that. I’m not saying I have no pain. I’m just saying that now, I have the pain response of a normal person (or close to it) rather than the extreme, overblown pain response of a few years ago. There’s a big difference between trying to ignore pain that you think could be a sign of something dangerous happening in your body, and deciding in a calm, rational manner that you are pretty sure you know what’s causing the pain, and that it is not a sign of immediate danger. Pain is there to protect you and get you to change your course of action when your nervous system thinks you might be in trouble. In that case, trying to push through the pain and going about your business as usual will only make the pain worse. But pausing and actually focusing on the pain, deciding you have a reasonable guess as to what’s causing it, and what to do to make it better, can make the pain go quiet. Or, at least, quieter. But you have to really believe that you are safe, for this to work. You can’t think there might be some hidden cause your doctors have missed, that part of your body might be falling apart. And it’s ok if that’s what you do think. It is certainly a valid position to be in. Sometimes there is no simple answer. I am not telling you you should be able to use the thought process I’m describing here all the time, or implying that there’s something “wrong” with you if you can’t talk yourself out of being scared. That is the exact opposite of what I’m saying. I’m just telling you that, the more you know about the body in an objective sense, the easier it will be for you to make sense out of it when the body gives you subjective input. In my own life, the more I learned about my own body, the less scary pain became to me, which in turn meant there were fewer alarm bells going off. It isn’t the answer to everything, but learning about these subjects might be the answer to some things. Thanks Rachel– glad you liked the post. I also have lots of ideas about how doctors and physical therapists should be incorporating more education about how our bodies work– particularly surrounding issues of pain– into their conversations with patients. I will (hopefully) be writing about this soon! I think the Neil Pearson approach de-mystifies pain. My pain has gone from being this faceless monster I was battling every day to a process which makes sense and can be influenced consciously. I totally agree with you when you say that to use this approach you have to really believe that the body is not injured or there isn’t some underlying problem causing the pain. I have had every test under the sun and so I can quite confidently tell my nervous system (and we have had many a chat since I came across your blog!) that all is ok and it can tell the brain not to send out any more pain signals. I don’t even think of my pain as fibromyalgia anymore which I am sure helps in the way I perceive it. I tend to think that I simply have a very sensitive nervous system which needs constant monitoring. I recently averted what I was sure would have been major flare up in the past using this technique and the results were just astounding. It is not the magic pill I had wished for when I first developed fibromyalgia but it comes a very close second! Your experience sounds so similar to mine. I also don’t think of my pain as fibromyalgia– I just use the word on my blog because I am hoping to reach people who think they have it. I think in some ways, the word “fibromyalgia” makes people even more frightened of their condition, which of course turns the “pain alarm system” up louder. Neil Pearson’s approach, as you put it, is so much better because it puts a face on something that was faceless, and gives you a way to take back control. I’m really glad this information has helped you as much as it’s helped me. Hopefully people will see your comments and be encouraged! Sorry, last comment was from me. Forgot to put in my name etc! I can blame the brain fog for that! I completely agree. For years, before I was introduced to Neil Pearson’s work, people suggested meditation and other mind-body, mindfulness-based approaches to dealing with pain. I tried all of them, and of course was frustrated when none of them had any effect on my pain. Sometimes I felt like I wasn’t doing them right; sometimes I was annoyed at the people who kept suggesting them to me, telling me that if I would just learn to “relax” or “listen to my body” the pain would just go away. I’ve reached the same conclusion: you really need specific information about how pain works in order to break the cycle. Relaxation and mindfulness-based approaches have their own place and purpose, but people should stop expecting them to be the “cure” for everything. Now that I’ve learned more about how pain works, I am able to meditate and explore other techniques (and actually benefit from them), without expecting them to take away my pain, and feeling like a failure when they don’t. Thank you so much for your blog and the info on Neil Pearson-amazing! Thanks to you and your blog I am just starting to view my fibromyalgia pain in a different way. Understanding what is going on in the nervous system makes a huge difference. I’m so happy my blog has been helpful for you! Thanks for the comment! I can’t speak for everyone, but based on what happened to me, I definitely had a lot more energy once the pain began to subside. Pain is exhausting– when I was going through the worst of it with my back, I felt like my body was trying to take naps just to escape from the pain. That doesn’t happen to me anymore. The other thing I would say is that if you’ve had a problem with fatigue for a long time, consider getting a sleep study done to check and see if you have sleep apnea, or any other kind of sleep-related condition. My sister had problems with being tired for her entire life, and despite the fact that she saw several sleep specialists over the years, she didn’t actually get a proper diagnosis until age 25. Thanks for your advice and link to the book, it is really helpful. Also good to hear that the tiredness may improve. I know from reading your blog that you will understand what I mean when I say that the Neil Pearson lectures are literally life-changing. The resources on your blog are excellent so am going to check some of those out too! My pain has more than halved since following some of his and your suggestions and the pain I have I am coping so much better with. I had no idea that our nervous systems could be influenced and healed in this way. That’s great that you’ve experienced such a reduction in pain! It sounds like this information is helping you as much as it’s helped me. It really is life-changing. I have just found that the Neil Pearson stuff has really got through to me. I have tried mindfulness meditation before and like the work of Jon Kabat-Zinn but it has never had any effect on my pain. I think without the information behind it as to why it works and what is actually happening in the nervous system it was never focused enough for me. In my case the information has been as powerful as the technique itself. Put both together and changes are possible. I look forward to your next post! I truly understand what you mean about knowing and understanding your body better so not to freak out when we have our pains, because some of the pains are very odd, and they can frighten you. I have jaggered, lightening like pains in my head out the clear blue. It is sporadic, and may happen 2-3 times in an entire month, then it does not happen again for another 2 to 3 months. I do not know what triggers them, but I have noticed that when I am anxious, rushing, and really tired, I seem to have them. Gosh… that sounds pretty awful. I can only imagine. Assuming your doctor has already ruled out potentially serious causes for the pain, I would suggest you look into the relationship between neck issues and headaches. I’ve had experiences in the past where muscle spasms in my neck and the muscles that run up the back of the head have caused headaches. I don’t know if you have any experience with this, but I have found that sometimes trigger points can cause all kinds of weird symptoms, including shooting pains. Just a thought. Thank you for reading, and for your comment :).